Exquisitely Rendered and Maintained Property! Living Area 8025 Sq. ft.
"Maxwellton" offers all that one could hope for in a luxury home. 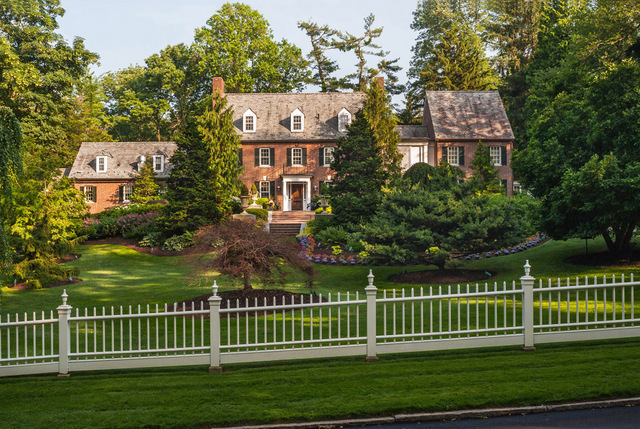 This exquisitely built and meticulously maintained, brick, Georgian style home is sited on a graceful hillside, at one of the most sought-after addresses of Philadelphia's Main Line. 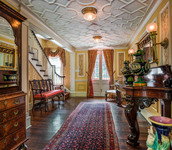 The five bedroom estate home features high style architectural details rarely seen in homes today. The floor plan blends intimate family areas with formal entertaining spaces. Numerous recent improvements and additions executed by notable contractors and design firms have brought all that this home offers to a level rarely seen. No details have been spared: From the luxurious master bedroom suite with its magnificent room of paneled closets to the chef's kitchen and pantry featuring top-of-the-line appliances and cabinetry, "Maxwellton" offers all that one could hope for in a luxury home. Set on a beautifully landscaped property, the gardens and terraces provide private outside rooms, suitable for dining, entertaining, relaxing and swimming. Special Features include: a built-in, top-of-the-line Sub Zero model 632, a luxury La Cornue Chateau 165 range, a Wolf built-in convection and microwave oven, professional Miele built-in coffee making system, etc. Pantry includes Wilkinson painted cabinets. "Dish room" provides 80 running feet of cabinetry. An ancillary kitchen is just off the main kitchen. A "chocolate room", designed for optimal humidity and temperature control for the production of chocolate dishes, includes a walk-in refrigerator and Wolf- cook-top stove and there is a custom-built wine cellar for tasting and study.